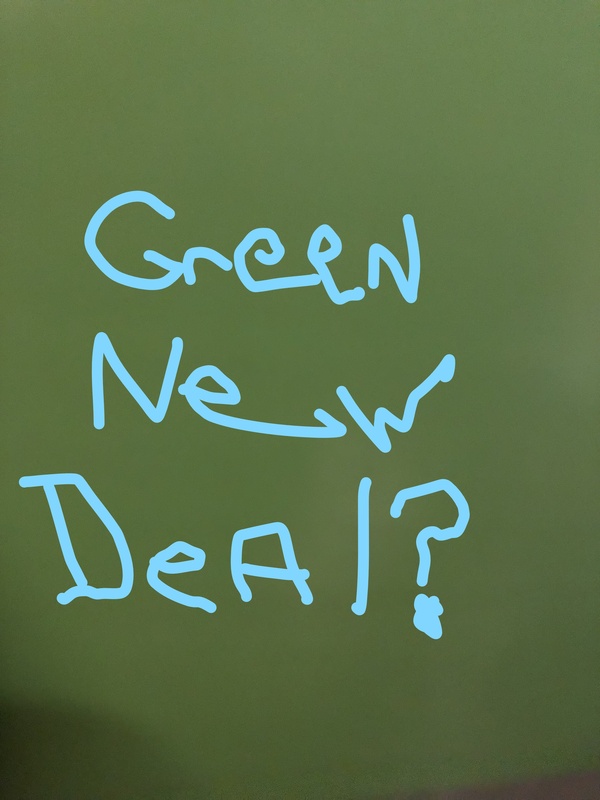 green new deal Archives - CUE, Inc.
Tag Archives for " green new deal "
Democrats are working behind the scenes to mend relationships between environmental and labor groups over climate change as support grows within the party for an aggressive shift away from coal and oil. Climate change has rocketed to the top of the Democratic agenda faster than anyone would have predicted before Rep.-elect Alexandria Ocasio-Cortez and hundreds of young activists stormed Nancy Pelosi‘s office last month. Now, the speed with which House Democrats and likely presidential candidates are embracing Ocasio-Cortez’s call for a “Green New Deal” select committee has some within the party worried about re-opening old rifts between the environmental groups and labor unions that make up the party’s base. “I haven’t noticed that they’re on the same page,” Rep. Raúl Grijalva (D-Ariz.) said of the environment and labor wings of the Democratic base. “It is incumbent on some of us to provide that bridge … and it’s also to the advocates at both ends to realize that their individual agendas are not going to be accomplished without each other,” he added. Ocasio-Cortez or her allies have reached out to unions including the AFL-CIO, International Brotherhood of Electrical Workers and United Steelworkers, according to an activist familiar with the effort who requested anonymity to discuss sensitive conversations. Ocasio-Cortez spokesman Corbin Trent said the incoming congresswoman’s office also has met with union leaders but declined to provide specifics. Sunrise reached out to IBEW last week, said Donnie Colston, director of the union’s utility department. Separate meetings among various factions are being convened by groups like the Center for American Progress and the Blue Green Alliance, a partnership of the Sierra Club, Steelworkers and other groups. Alliance members including met Friday to discuss a range of issues, but spokesman Eric Steen decline to offer specifics. “For over a decade, the BlueGreen Alliance has focused on putting workers first as we address the climate crisis. We are actively discussing multiple solutions that would achieve the bold economic transformation our nation needs to have a fair, clean, and prosperous future,” Steen said in a statement. So far, 37 incoming or current House Democrats have endorsed the Green New Deal as well as a number of senators, including potential 2020 presidential candidates Sens. Cory Booker (D-N.J.), Jeff Merkley (D-Ore.) and Bernie Sanders (I-Vt.). Environmental activists have largely abandoned the “keep it in the ground” slogan that animated protests against the Keystone XL and Dakota Access pipelines but split Democratic voters ahead of the 2016 primary. Now framed as a “Green New Deal,” the goal is essentially the same — replacing fossil fuels with cleaner sources of energy — but it is being pitched as an economic revitalization program. Ocasio-Cortez has credited her participation in anti-Dakota Access protests with awakening her to the threats of climate change, but other Democrats bristle at the reminder of those protests. Most major unions are taking a wait-and-see approach until more details are filled in of what exactly a Green New Deal would entail. Environmental groups likewise insist the speed with which the U.S. moves away from fossil fuels is up for debate, though Ocasio-Cortez’s resolution calls for a massive decarbonization by 2030. Even before this year’s midterms, the Democratic National Committee had convened meetings among environmental and labor groups before the election in an attempt to find areas of convergence andease tensions over an aborted effort to ban contributions from the fossil fuel companies, according to a source who attended one of the meetings. The party briefly backed such a ban last summer before quickly reversing itself amid an outcry from labor unions and others. The DNC has not taken a position on the Green New Deal but sees an infrastructure-style plan as an opportunity to achieve both environmental and pro-labor goals. Evan Weber, national political director of Sunrise Movement, said his group has doubled down on making connections with labor organizations. He said the demonstrations thrust Sunrise into the national conversation perhaps faster than anticipated, which waylaid some the group’s pre-spotlight efforts to build stronger ties with labor. Earlier this month, Ocasio-Cortez quietly amended her proposed resolution calling for a Green New Deal select committee to bolster support among labor unions and their allies in Congress. She added language calling for a right to unionize and to work with communities where fossil fuel jobs represent a large share of employment. Those tweaks helped win support from Congressional Progressive Caucus co-chairs Reps. Mark Pocan (D-Wis.) and Pramila Jayapal (D-Wash.). Some unions have thrown their weight behind the Green New Deal. SEIU 32BJ, which represents 163,000 porters, doormen and maintenance workers across the Northeast, endorsed the idea last week. So too has UAW local 4121, a chapter of the United Automobile Workers based in Seattle. But other unions remain unconvinced that environmentalists understand the reality union members who work in energy intensive industries face. That makes it difficult to attract support from unions like the Laborers International Union of North America, which nationally contributes overwhelmingly to Democrats but often aligns with industry groups against environmental regulations. Laborers International President Terry O’Sullivan is scheduled to join the Chamber of Commerce’s Karen Harbert on Tuesday to promote a report warning against “the anti-energy ‘Keep It In the Ground’ movement,” according to a press release from the Chamber. Green New Deal and renewable energy proponents writ large, however, argue that clean energy jobs are more sustainable in the long term and may provide more opportunities in underemployed communities. Collin O’Mara, CEO of the National Wildlife Federation, said unions’ concerns could be addressed through things like ensuring an infrastructure plan includes Davis-Bacon Act language, which provides federal contracts pay prevailing wages and offer fringe benefits to workers. The same goes for making explicit pledges to guarantee collective bargaining rights and ability to unionize, as many clean energy firms have flouted those labor movement pillars. Even the differences between renewable energy and clean energy — the latter being a larger umbrella that includes nuclear and carbon capture and storage technology — would signal to many more trade union members that there’s space in the environmental movement for them. One former Hillary Clinton policy adviser expressed hope the two sides can work together. “Ideas that get elected officials seriously talking about the climate crisis are positive, and I hope the Green New Deal, as it evolves, will take seriously the need to support unionization in the clean energy sector,” the person said.